"Add notes, images and other corrections to your PDF files"
Do you still think that PDF files cannot be modified? With PDF Annotator it's possible. PDF Annotator lets you add changes to your PDF files. After that, you can save the files with the same format. That means they can be opened from any other computer without need of installing special programs. Adding notes is only one of the options. You can also mark (highlight) or underline parts of the text that you want or consider important. 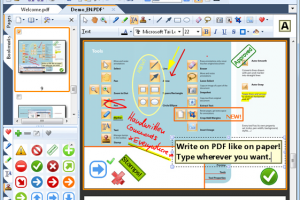 Adding drawings and images is also possible, so you will be able to express your ideas visually with PDF Annotator. You can also fill in forms directly from your computer, notebook or Tablet. If you receive an agreement, you can sign it and just send it back by e-mail. Windows 7, Windows Vista, Windows XP and Windows 2000 are supported by this software. PDF Annotator is a versatile and easy-to-use application to edit PDF files.